The speed of data collection in companies is far greater than their respective processing or analysis. Often times, organizations feel they are well informed simply because they possess data. These bytes, however, are worth nothing if not analyzed correctly and in a timely manner. That is why Data Mining and Data Science are becoming increasingly more important. Data Science applies Data Mining tools to the data and revolutionizes the decision-making process in a business. Why use Data Science? A study by Sloan School of Management has shown concrete evidence of a return on investment with Data Science in businesses. Those that adopt decision-making processes based on analytical methods show an increase in productivity between 5 and 6%. Due to the gradual decline in storage costs, with options like the cloud, increasingly larger amounts of data can be stored with no added cost to the company. The convergence between operational and analytical environments in companies modifies the user experience and the speed of decision-making. There are certain types of data considered unfriendly towards traditional analytical processes, such as text data, images and audio retrieved from social media. Data Mining is capable of revealing the implicit knowledge in an organizations’ database, with the ability to create a future analysis and predict trends or behaviors, enabling decision-making based on facts. And what is Data Mining? Data Mining literally means the mining of data and is part of Data Science. Data Mining is the use of computer tools, usually based on mathematics or statistics, for the extraction of knowledge from a company’s data. Many Data Scientists start off creating codes and algorithms and later discover that those weren’t quite what the client wanted, be that an internal or external client. For such occasions there is the CRISP-DM (Cross Industry Standard Process for Data Mining), a process model enabling a holistic view of a project’s life cycle. The CRISP-DM methodology gathers the best practices so that these Data Mining tools can be used in as productive a way as possible. CRISP-DM can be applied when analyzing commercial, financial, human resources, industrial production, services rendered and other data. Check out how it works in 6 steps. 42% of companies that perform Data Mining use CRISP-DM to mine their data. See below a brief description of this process. Obviously, it’s crucial to have knowledge of the problem that needs to be solved within the business, even though this problem may change throughout the process. This might seem obvious but, in many cases, this demand comes in an ambiguous form. This is the creative analysis step, where the human aspect is crucial to a sound understanding of the real problem to be solved. The available data is the raw material on which the solution will be built. Often, not even the companies are aware of the potential their data holds. This inquiry is done to identify the qualities and limitations of the available data, even checking if there is enough data to mine. In this case, one can assess whether there is another source of data available and if it’s possible to acquire it. Many companies underestimate the effort needed during this step to prepare the data so they are adequate for mining. The analytical tools usually require that the data be in specific formats and data conversion is one of the most common tasks during data preparation. On several occasions, the data also needs to be cleaned and enriched with other data sources so they can be correctly analyzed. A model is an attempt to understand or represent the reality from a certain perspective, usually technical or scientific in nature. It’s an artificial construction, where non-relevant details are removed or ignored. 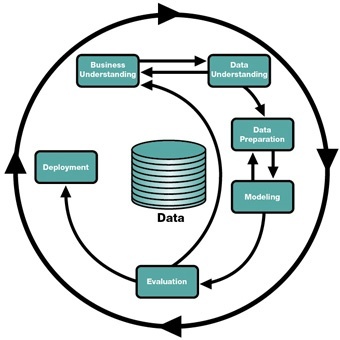 The modeling stage is where Data Mining techniques are applied to the data themselves. It’s crucial for the entire team to have good knowledge, even of the types of techniques and tools available. It’s common to revisit data preparation during this stage. The evaluation phase is where the results are analyzed and checked to see if they are valid and trustworthy, thus deciding if there is justification for undertaking new investments. It’s crucial to trust that the models and patterns extracted from the data represent everyday situations of the business and are not idiosyncratic anomalies. At the end of the day, the main objective of the analysis phase is to ensure that the generated models meet the objectives of the business initially outlined. The knowledge gathered through modeling is organized and presented in a way that enables the client to apply it. The possible results are new applications, changes in company processes or even new product launches.